Salina Regional Health Center, in Salina, KS, is now seeking a full time BE/BC Ophthalmologist to help develop this service line. Candidates must have excellent surgical and interpersonal skills, provide high quality patient care and possess an interest in facilitating practice advancement. You will have the opportunity to build your business quickly as SRHC employs 22 family medicine providers. A highlight of this opportunity is to be surrounded by an adept and skilled OR staff; including a team lead with 30 years of experience. Salina Regional has 8 OR's. Benefits include; sign on bonus, relocation allowance, patient satisfaction, quality and RVU production bonuses, stipend for residents & fellows, medical, dental & vision insurance, retirement with match, CME time off and allowance and paid malpractice. SRHC is a level III, comprehensive acute care hospital that serves 250,000 people throughout north central Kansas. We are not only succeeding, but we are leading the way in healthcare in Kansas. Salina is a progressive community of 50,000 nestled on the plains in the heart of Kansas. Enjoy the area's vast recreational amenities, some of which include our beautiful golf courses, parks and lakes. The performing arts center, community theater, remarkable zoo and entertaining festivals are among the many activities you and your family will enjoy in Salina! With a strong sense of family and community, you are sure to enjoy your life and career in Salina! Salina Regional Health Center (SRHC) located in Salina, Kansas is a not-for-profit comprehensive acute care hospital that serves all of north central Kansas. Our commitment to excellence makes a difference in people's lives, giving them the confidence that comes from getting better and stronger, every day. At Salina Regional, physicians practice old-fashioned compassion, complemented with the latest technologies to make healing happen even faster, delivering confidence for today, for the future, and for the good life. In June 2018 SRHC received Chest Pain Center with Primary PCI Accreditation from the American College of Cardiology. In January 2017 SRHC was awarded Primary Stroke Certification by the Healthcare Facilities Accreditation Program (HFAP). In May 2016, SRHC launched Salina Regional Orthopedic Clinic, a comprehensive orthopedic clinic with a focus on sports medicine. In January 2016 SRHC launched a telemedicine service line, Vcare, to include behavioral health, nutritional & diabetic counseling and general surgery. August 2014 SRHC received an award for HealthCare’s 2014 Most Wired Hospital. 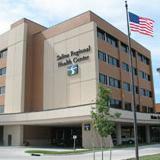 Health Networks magazine named Salina Regional Health Center among the 2014 Most Wired Hospitals. SRHC was one of four hospitals in Kansas to earn the Most Wired designation. June 1, 2013 COMCARE, a family medicine clinic, joined Salina Regional Health Center. We now employ 70+ physicians and 40+ advanced practice providers. Fall 2013 SRHC completed a new 18 bed Intensive Care Unit. This expansion comes on the heels of our $70 million dollar six story patient tower and 26 bed Emergency Room. In 2013 SRHC achieved Level III Trauma verification from the American College of Surgeons. Salina is home to the University of Kansas School of Medicine Salina campus and to KU Smoky Hill Family Medicine Residency Program. SRHC has been recognized for our commitment to quality care, community service and state-of-the-art medical equipment with additions of a PET Scan, 128 slice CT, da Vinci Robotic Surgical System, HALO Ablation Catheter and coming soon a new Brain Lab. Salina is a progressive city with a growing population of 50,000. A diverse economy and strong work ethic allows the community to continually rank among Kansas' best in areas such as cost of living, regional trade pull, unemployment, and personal income. Our community serves as the regional hub for state-of-the-art medical services and also serves as the regional hub for retail trade and entertainment. Our community also provides many educational opportunities that range from private and public grade schools to four year universities. Enjoy the areas vast recreational amenities, some of which include our beautiful golf courses, parks and lakes. The performing arts center, community theater, remarkable zoo and entertaining festivals are among the many activities you and your family will enjoy. Salina has been selected by Business Week magazine as one of the best places in Kansas to raise your kids! For those of us familiar with the community, this is no surprise.